Multiple people have posted on the forum asking for a like button. There are like plugins for this forum, some of which connect to Facebook and some that don't, and that is fine and good. However when I set up this site I took advantage of a more powerful addon called YAGA, short for: Yet Another Gaming Application. 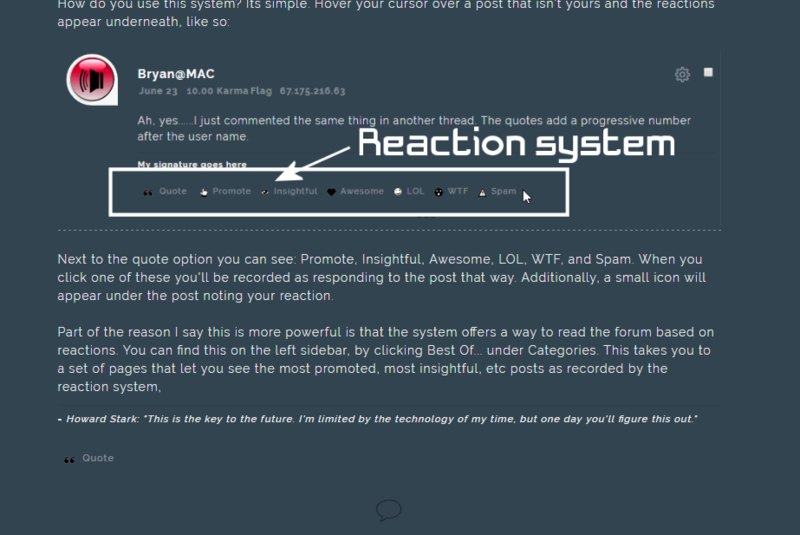 This addon allows users to respond to posts in any manner we deem valid and comes with a set of reactions for which I didn't even feel the need to expand on. Next to the quote option you can see: Promote, Insightful, Awesome, LOL, WTF, and Spam. When you click one of these you'll be recorded as responding to the post that way. Additionally, a small icon will appear under the post noting your reaction. Not sure I understand what this is, Jason - see attached screen shot of the options I am presented with beneath your post. It appears all I have is the "quote" feature. I think I fixed the permissions issue, but it also seems you might need to click on the post to see the reactions, which I don't get. Also, you won't have Promote. That is a special reaction for users up in ranks to add extra points over Insightful. Weird - at home I have to physically click in the body of the post to activate the "attaboys", on my PC at work the hover feature works. Using Win10 here at work, Win7 at home.